Wow! I can't believe it's Friday! These last few weeks of my kids' school is loaded with activity! This week was Teacher Appreciation Week. There was something everyday for the teachers and staff. 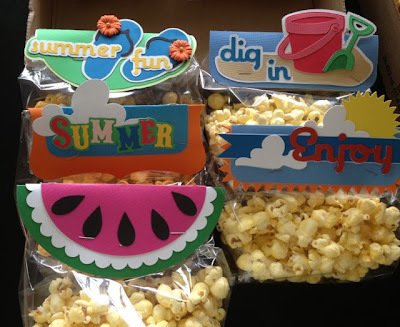 The theme is Summer Fun and today is snack day:-) I found the most perfect Cricut die set on Cricut Craftroom called Bag Toppers - Summer. My goal was 80 but only made it to 50 bags. 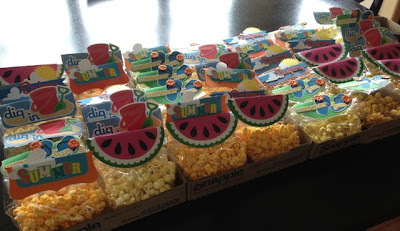 I had volunteered for snack day before I found out about the big 5th grade project due next week (I'll post a pick of that later). Not only that, but I also found out that I'm going with Sydney, Australia for a week with my DH in a week. So, I had to cut back somewhere. I bought some clear cello treat bags at Hobby Lobby, filled them with different popcorns, then stapled the toppers to the bag. OH my Goodness...This is AMAZING!!! TOTALLY cute!The kids will love it! These are all so super cute! I love them all! Your treat toppers are adorable!! Super summery! 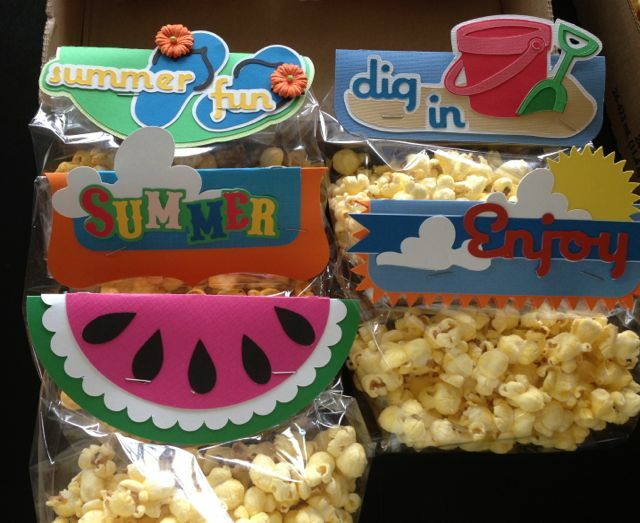 The popcorn looks yummy too! Have fun in Sydney!